Waves has continued to climb over the last 24hrs despite a largely bearish market - up another 12% against BTC and en route to bank a 160% gain overall in one month. This encouraged a second surge of bullish momentum to pick Waves back up and make a strong return to the 60,000 Sats level. So far, little bearish resistance has held the asset back, allowing this coin to decouple from the falling market and soar. The Waves ‘Smart Assets’ are set to go live sometime tomorrow, and activate in a further two weeks. Will this coin continue to climb over the next few weeks, or should we expect this buying frenzy to dump soon as profit-takers secure their gains? Let’s take a look. In the video analysis, we can see that Waves has exhibited some classic trading patterns in its price action throughout the year, having tracked inside of a bullish falling wedge during Q1 2018, then straight into a bearish head and shoulders setup over Q2 and finally hit a double top over Q3/Q4. Catching up with the asset now on the 1D WAVES/BTC chart we can see that Waves is still uptrending after the double top on November 21, fuelled by the recent flurry of new feature announcements and undeterred by Bitcoin’s value plummeting nearly -30% in the last month. 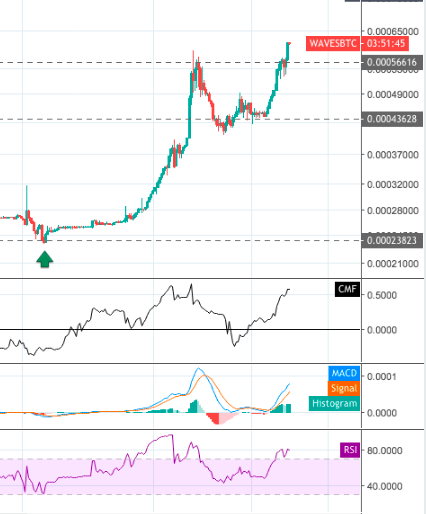 After correcting on to a long-standing support level at 43.628 Sats, the Waves Smart Assets announcement was able to trigger a second strong impulse movement beyond the first resistance target at 56,616 Sats. At this point, Waves experienced another brief correction phase as short-term traders took profit at this level, expecting the asset to double top back down. However as we can see, the asset was able to spike again - this time peaking to its current value at 62,000 Sats. On the 4hr chart indicators shown above, we can see that bullish momentum is still growing behind the asset - no doubt as new short-term investors flock to this asset, attracted by WAVES strong market performance. (Top) The Chaikin Money Flow indicator is still spiking high above the zero line as buying pressure continues to flood into this asset. (Middle) The MACD indicator is also showing a huge bullish bifurcation between the 12MA and the 26MA, with long buying candles on the histogram. (Bottom) On the RSI indicator, WAVES is highly overbought, up 11% outside of the index channel. While this is all very promising, given the current bearish market conditions this asset will be under significant threat of attracting intraday traders searching for quick profits. If too many of these types of traders enter the market, we could see WAVES struggle to shake off the selling pressure at key resistance levels once they all start cashing out and exiting. For now though, bullish sentiment appears to be very strong and we still have yet to see any sign of substantial bearish selling pressure affect the price action. All price targets are set from the asset’s current value at 62,300 Sats (at time of writing).